The links below set out all you need to know about using this website. They detail legal sections, contact details and information about how things can change. 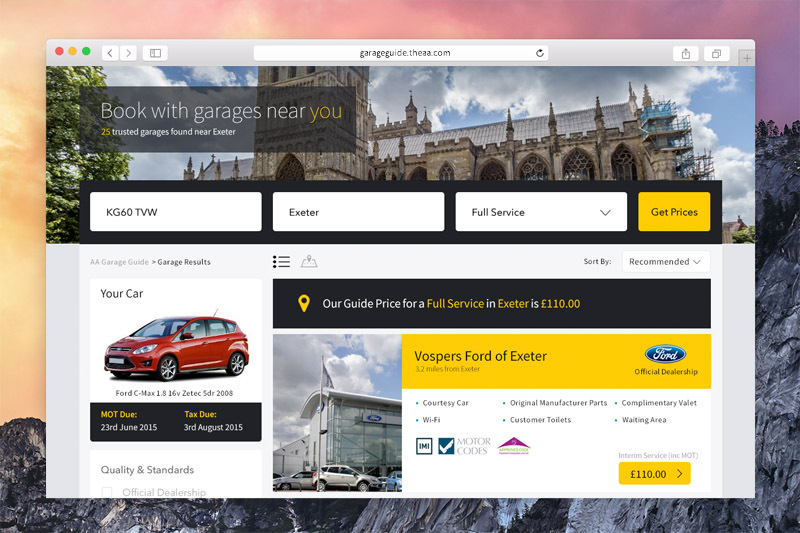 If you book with a garage via your use of the Website the garage will not be able to digitally verify the works completed and add these to your vehicle history unless you rate and review your experience of that garage. Therefore, when requesting a booking at a garage via the Website you agree to rate and review your experience of that garage after they have completed work on your vehicle, via the Website rating and review process. Likewise, we oblige garages carrying out work booked via the Website to digitally verify the works completed. The information provided by us on the Website is intended to be general in nature and is not in any way an invitation or recommendation to buy any of the products or services featured on the Website, including from any of the garages featured. While we try to ensure that all information provided on the Website is accurate and correct at the time of inclusion on the Website, we do not represent, warrant or promise that any of the information is or remains accurate, comprehensive, verified, complete and up to date, free from bugs, errors or omissions nor any representation or warranty as to the adequacy or suitability. We accept no liability for the accuracy or completeness of any information contained on the Website or for any reliance placed by any person on the information. The Website contains links or references to third party websites, which may include third party goods and services. We have no control over these third party websites and therefore assume no responsibility for any content, material or information contained in them or any goods and services offered via them. We promote a number of suppliers on the Website and you may contact them via the Website to buy goods and services from those suppliers, for example to book your vehicle for a service or repair. Any supply of goods or services to you by a garage listed on the Website will result in a contract between you and the relevant garage. We have no control over any third party and you should satisfy yourself that you wish to purchase those goods or services before contacting the supplier. The third party supplier advertising the products or services concerned may accept or reject your offer at its sole discretion. We accept not liability for any goods or services provided by third party suppliers. The inclusion of a hyperlink or reference to a third party website does not constitute an endorsement of such third party’s website, products or services. Your use of any third party website may be governed by the terms and condition of that third party website and you should read these carefully before using the third party website. All materials presented on this Website, unless specifically indicated otherwise, are under copyright to us or our licensors. We reserve all rights. You are free to download or print a single copy of the contents of the Website but you may not reproduce or redistribute materials, in whole or part, on this Website without our prior written permission. All AA trademarks used on this Website are the registered trade mark of AA Brand Management Limited and are used under licence from Automobile Association Developments Limited. You shall retain ownership of all copyright in content that you submit to the Website, for example reviews or feedback on services provided to you by a garage. You grant us a world-wide, non-exclusive, royalty-free, non-terminable licence to use, copy, distribute, publish and transmit such content in any manner. If you submit content or data for display on the Website you are responsible for ensuring that the content or data is accurate, complete and up to date and for updating that content or data where necessary for ensuring that no content or data is uploaded or submitted which is untrue, defamatory, obscene or abusive or otherwise objectionable or in breach of any applicable laws or rights of third parties. You warrant that you have taken all reasonable precautions to ensure that any content and data you upload or otherwise submit to the Website is free from viruses and anything else which may have a contaminating or destructive effect on any part of the Website or any other technology. On registering with us, you are issued with or may choose a user name and password which must be used to access your account. The user name and password is personal to you and is not transferable. Your name and password are the methods used by us to identify you and are very important. You are responsible for all information posted on the Website by anyone using your user name and password and any payments due for any services accessed through the Website by anyone using your user name and password. Any breach of security of a user name and password should be notified to us immediately. Whilst we take care to try and ensure all content and data on the Website is accurate and correct, you agree that your use of the Website is on an ‘as is’ basis and (to the extent permitted by applicable law) we disclaim all warranties and representation (whether express or implied) in relation to the provision of the Website, including without limitation, as to the completeness, accuracy and currency of any content or any information on the Website, or as to the satisfactory quality or fitness for a particular purpose of the Website.